We decided to track WB on the heels of its earnings beat yesterday and formulated a range of call contracts that we thought would see some nice activity as a result. Post-earnings options ideas are among our favorite types of plays, and WB serves as another example of why we’re always coming back to that well. Weibo was our fresh idea for yesterday, and today we’ve got another set of ideas to enter into the mix today with TGT. Based purely on the look of the chart, this morning’s earnings notwithstanding, we’re attracted to the massive gap to fill to the upside, part of which has begun to fill as TGT is gapping up in the premarket. We’re interested to follow progress on a range of both short and longer-term ideas, namely the TGT Weekly $57-59 Calls, as well as the TGT 06/23 $60-62 Calls. .
We tagged XGTI for observation yesterday morning, and the stock did make a modest move of 24%, trading up from a low of 1.72 to 2.14 on the day. While not an eye-popping move in and of itself, it did occur on massive volume, on the order of roughly 70X the 30-day average, and this morning in the premarket the stock has hit a new high of 2.19. We’ll definitely be on the lookout for a continuation of the momentum that is built up in this stock. We’ve had a sizable influx of new subscribers join our ranks in the past several days, so we wanted to take a minute this morning to officially greet our new readers! We’re glad you decided to join up to get our heads-up ideas on everything from stocks, to ETFs, to options! 2017 has started off as another great year for us, and we only expect it to get better! Feel free to reply to any of our reports with questions (or ideas of your own), and if you enjoy our daily newsletter, by all means, share us with a friend! Also, remember that you can view daily reports, and access archives of the last 7 years of those reports on BlueHorseshoeStocks.com! We also conduct real-time daily traders chats that are open to any of our subscribers, and that includes you! Simply send a Skype contact request to username ‘stocksumo’ with ‘traders chat’ in the note and after a quick introductory chat, we’ll add you right away! We reported our interest in tracking some BURL options in the wake of a strong earnings report yesterday morning, and signaled the BURL 03/17 $85-95 Calls. Just as we suspected, the boost of momentum from that earnings beat provided the fuel for those contracts to put up some impressive performances on the day. 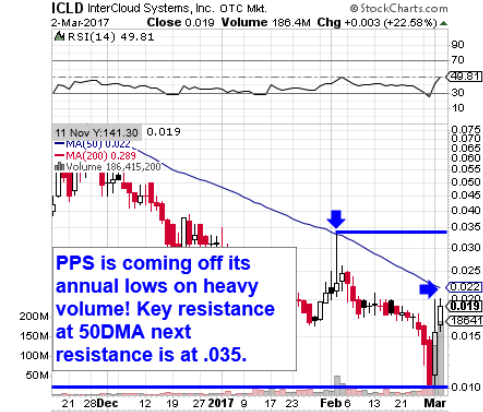 We also want to continue keeping an eye on ICLD, in which volume has been exploding over the past couple sessions as the stock has rebounded off of its 52-week lows. 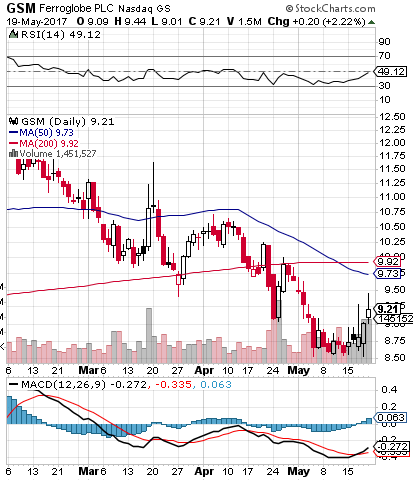 The stock traded in a relatively modest range from .0157 to .02 (+27%) yesterday, but closed with strength. Especially with the enormous flow of volume at the present time, we’re definitely interested in tracking ICLD’s movements over the next several sessions. Big Lots, Inc. BIG - Big Lots had a mixed bag earnings report today, missing estimates on sales, but beating on profits. Still, it appears as if BIG could be gearing up for a decent run, so we’re going to highlight a range of options to track- the BIG 03/17 $52.50-57.50 Calls. 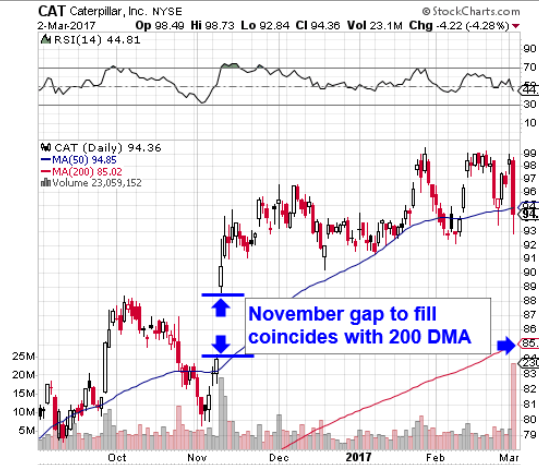 Caterpillar, Inc. CAT – On a bearish note, things got ugly for Caterpillar yesterday as multiple federal agencies participated in a massive raid of its offices in relation to a years-long IRS investigation into a billion dollar tax discrepancy. CAT stock took a massive gut punch, and could continue to see hardship as more details of the investigation and possible consequences become available. We’ll be tracking the CAT 04/07 $88-85 Puts, which could fare extremely well if it comes down to fill a gap on its chart which we’ve pointed out below.